This work is funded by grants from the US National Science Foundation (NSF, A.L.R., M.K.T, K.L.V.D. ), a PSU Faculty Enhancement Award (A.L. R.), the Natural Science and Engineering Research Council of Canada (NSERC), and the US-Department of Energy (T.J.B.) and US-National Research Program, Water Resources Division, USGS and NASA Exobiology (MAV). Deep-sea hydrothermal vents are important in global biogeochemical cycles, providing biological oases at the sea floor that are supported by the thermal and chemical flux from the Earth's interior. As hot, acidic and reduced hydrothermal fluids mix with cold, alkaline and oxygenated sea water, minerals precipitate to form porous sulphide–sulphate deposits. These structures provide microhabitats for a diversity of prokaryotes that exploit the geochemical and physical gradients in this dynamic ecosystem. It has been proposed that fluid pH in the actively venting sulphide structures is generally low (pH < 4.5), yet no extreme thermoacidophile has been isolated from vent deposits. 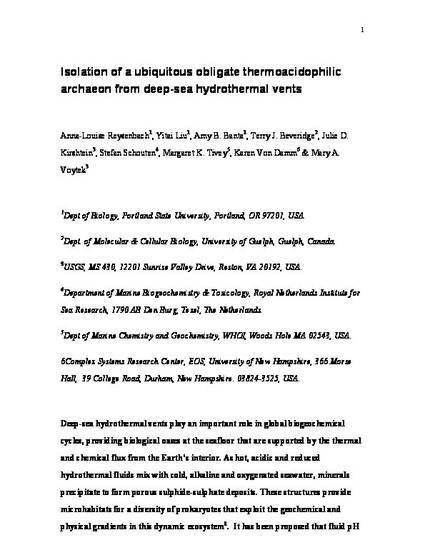 Culture-independent surveys based on ribosomal RNA genes from deep-sea hydrothermal deposits have identified a widespread euryarchaeotal lineage, DHVE2 (deep-sea hydrothermal vent euryarchaeotic 2) Despite the ubiquity and apparent deep-sea endemism of DHVE2, cultivation of this group has been unsuccessful and thus its metabolism remains a mystery. Here we report the isolation and cultivation of a member of the DHVE2 group, which is an obligate thermoacidophilic sulphur- or iron-reducing heterotroph capable of growing from pH 3.3 to 5.8 and between 55 and 75 °C. In addition, we demonstrate that this isolate constitutes up to 15% of the archaeal population, providing evidence that thermoacidophiles may be key players in the sulphur and iron cycling at deep-sea vents. This is the author's version of the work. It is posted here by permission of Nature Publishing Group for personal use, not for redistribution. The definitive version was published in Nature 442 (2006): 444-447.